Prince Harry landed in Jamaica on the final leg of his tour of the Caribbean and Central America to mark the Queen's Diamond Jubilee. Members of the Jamaican Defence Force greeted the 27-year-old Harry with a 21-gun salute as his jet touched down at Norman Manley International Airport outside Kingston. 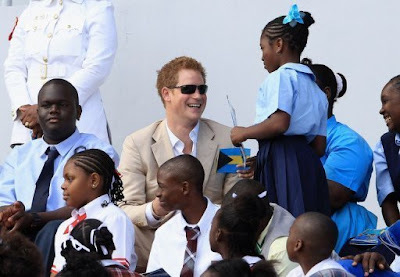 Making his first solo tour, the third in line to the throne has also visited Belize and the Bahamas during the trip. He will then head to Brazil on March 9 on behalf of the British government. "The Prince is hugely looking forward to representing the Queen and he will bring his own brand of enthusiasm and energy to every event," Harry's private secretary Jamie Lowther-Pinkerton said last week. Harry's official visit will begin on Tuesday with a tour of the University of the West Indies -- where he could participate in a fun run with Olympic sprint champion Usain Bolt -- and two hospitals. He will also meet Jamaican Prime Minister Portia Simpson Miller, who wants the Caribbean nation to drop the queen as head of state. The prince's tour is one of several being made by the royals in 2012 as part of celebrations marking 60 years of the Queen's reign. 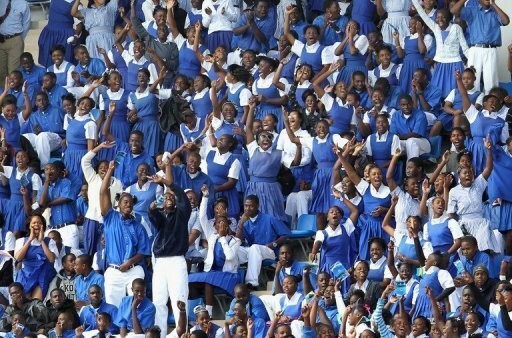 Schoolchildren cheer Prince Harry as he attends a youth rally in Bahamas. Harry's brother Prince William and William's wife Catherine will travel to the Asia-Pacific region, while heir to the throne Prince Charles and his wife Camilla will visit countries including Australia and Canada. Harry, who qualified as an army Apache attack helicopter pilot last month, is keen to return to combat in Afghanistan after he was hastily withdrawn from his first tour of duty in 2008 when a media blackout was broken.